The Granite Gurus: DIY Side Table Contest--WIN A TABLE TOP FROM MGS BY DESIGN! DIY Side Table Contest--WIN A TABLE TOP FROM MGS BY DESIGN! We are so excited to announce our DIY Table Contest! We want you to submit photos of your tables and nightstands that don't have a top or are in need of a new top. You could have found the table at a thrift store, in your granny's attic or maybe you made the base of the table yourself! Submit a photo of your table by posting it on our Facebook Wall and encourage all your friends and family to LIKE your picture. The table with the most "likes" wins! 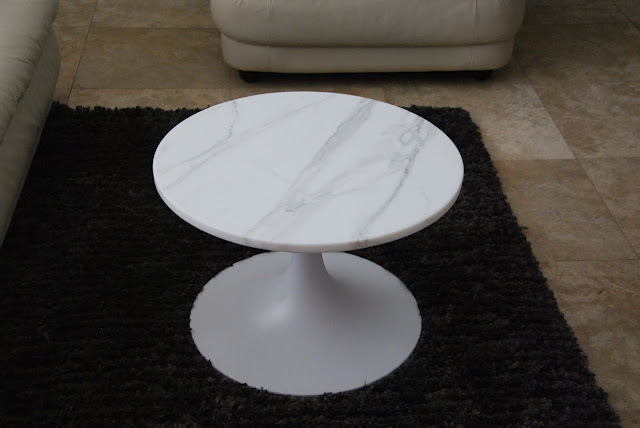 The winner will receive a stone table top for their DIY Table courtesy of us. You will choose from any of the remnant pieces in our yard. We have a lot of beautiful granite, marble, quartz, etc available for the winner to select from. We'll cut and fabricate the piece for the winner! This first one is actually my own table. I found the Saarinen Low Oval Coffee Table replica base through my local classifieds for $65.00. I put a coat of spray paint on it to freshen it up. We had a remnant of Calacatta Gold marble that I had cut to size and it's like new! This second table was one we did a couple of years ago. The client brought in her not-so-pretty base that she'd found at a thrift store and we helped her find a remnant of Carrara marble to go on top. When she brought the base back in after she'd painted it I about died. HUGE transformation! It turned out so cute! You can read more about it here. For more inspiration check out our post Marble & Granite for Furniture Projects. Take a picture of a table you'd like a top for. Submit that photo on our Facebook Wall. Get your friends, family and strangers to LIKE your photo on Facebook. The photo with the most 'likes' wins! Submit your photos by Friday, July 13th. We'll announce the winner here on the blog Monday, July 16th 2012. The winner will receive a top made from any remnant in our yard, winner gets to select the piece. The winner must be able to pick up their top at our shop in Vineyard, Utah (Utah county, just north of Orem). You can enter the contest if you are out of state, but you must be willing to come to our shop to select the piece and to pick up the finished top about 2 weeks later. Maximum size of the piece is 36" long by 24" deep. Keep this in mind when submitting your table. Don't submit anything larger than this. Good luck! We're excited to see your tables! I REALLY love the turquoise base. I wish I had one of those so I could then put one of your pretty marble slabs on top!